So I held a Twitter poll a couple of days ago and, since the majority were supportive, my next two posts will be analysing the other two important international engines from The Great Race. Next time I'll be focusing on Ashima, but this one will be focusing on a TV series returnee... kind of. Anyway, Flying Scotsman! First off, the fact this was another Railway Series character appearing (properly as a character, rather than a plot device), it's made me wonder whether this is becoming tradition to include a once book exclusive character each year. If so, I'm hoping for Bear, if only to boost large diesel numbers. Secondly, the more I reflect on his personality in the books, the more I think that it's really dry. It feels like Awdry focuses on the fact he's still around, as well as having a catch up with Gordon, rather than actually giving him his own character. That said, at least it's better than what he was given in series 3 of the show. Now I'm not going to rant about series 3 like I did in 2011 as I've realised that I was way too harsh towards it. However, I do still believe that Tender Engines isn't really the best from that series. 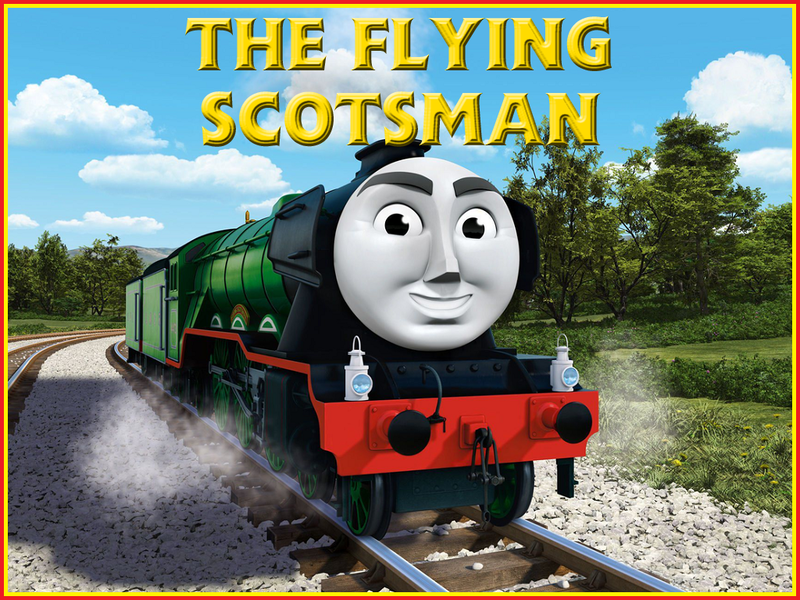 Even discounting the fact that the first half completely lacked the emotion that the original had, Scotsman's appearance was very disappointing. Only showing his rear end (which, weirdly, modelled him with two coal tenders rather than one for coal and another for water while lacking the corridor compartments) and a bit of the cab was a let down, especially in a series that included a beautiful model of City of Truro. I know that they lacked the budget to finish the model, but if you're going to include something that's major to a story, wouldn't you put the money aside for it? Another disappointment is that Flying Scotsman was treated more as an outsider rather than Gordon's relative. Whatever the reason is for that is unknown, but considering the series ended up in a "magical universe" by the time Britt left, I can't really say I'm surprised; relating one of the world's most famous real life locomotives with a fictional one would screw up her vision (not having a go, just hypothesising). In The Great Race, though, I feel that the team actually had him live up to the potential that he has as a character, rather than just there to reminisce or to be a plot point. His exposition gets the plot going and, even though he's missing for around half an hour after that, they don't drop the ball with him, even if they do with the actual plot. His main characteristic is having a sibling rivalry with Gordon, although he still has a gentle, caring side like an actual big brother. It made me really gravitate towards the dynamic as I know that my brother and I have a similar one. Granted, it took me two watches to figure this out, but after the first one, my head was so scrambled that I couldn't really put my feelings of the special into words. I think the only negative that I have towards his character is that, when Gordon breaks down (which loses all significance as he manages to get back to Sodor under his own power regardless), Scotsman doesn't stop to help his brother out, which is a huge shame as, a few seconds before, he was warning Gordon that something was wrong. So it leads to a confusing turn for his character: does he only care for Gordon up to a point? Did he care more about winning the race solely for bragging rights? If so, that seems rather immature for a bigger brother... I really do think he should have gone back, rescued Gordon, then let the two have a heart to heart on the way back to the yard. I feel that it could have led to great character development for both whilst providing another great moral for kids. The other issue I have is with his design. And before anyone says it, I've no issue with the smoke deflector/double tender combo. There have been some complaints about it because "the real thing never had that", but I really don't care. It's quite nice that they decided to add two different eras of the locomotive into one render. Oh, and I've no problem with the smoke deflectors moving either. If I complained about that, I'd probably have to complain about the fact he has a face. It's Thomas & Friends for goodness sake; there has to be some suspension of disbelief somewhere. No, my real problem is that his livery application and tender design feel rather... slapdash. Both tenders have only 6 wheels rather than 8, and while I love the green livery, it feels like he was modelled to be a TV series character rather than an actual locomotive. Compare the render to the Railway Series illustrations of him and you'll see where I'm coming from. The plain white lining that feels straight from the ERTL toy, the plain red running board, the plain green wheels. All of it seems more like a work in progress rather than a finished render. Also, as a nitpick, why was there a tail lamp where the corridor compartment should be? Couldn't they have put two on either side of it or something? Overall though, I'm really happy that they decided to include Flying Scotsman in the whole spectacle, and I'm delighted that they gave him a bit of character. Sure, his design isn't as great as it could be, but if his TV series-style design choices mean that he'll be the only international engine from The Great Race to actually appear more as time goes on, I can live with them.